Marion Donovan invented the first disposable diaper with plastic sheet on the outside. It is a sponge-like garment primarily worn by babies who are not yet toilet trained. The earliest disposables used wood pulp fluff, cellulose wadding, fluff cellulose, or cotton fibers as the absorbent material. Some disposable diapers include fragrances to mask the scent of a soiled diaper. Disposable diapers became more popular than cloth diapers. One of the most obvious reasons why many choose to use it because of convenience. 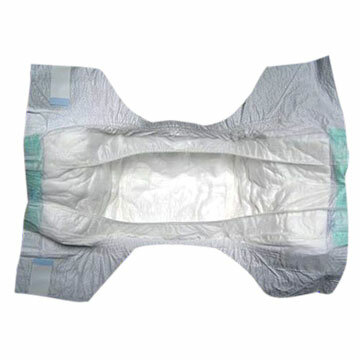 They can be bought in any retail stores, convenient when travelling and much more absorbent than a cloth diaper. Another benefit of using disposable diaper is that it is much cheaper looking at the labor cost, the effort to laundry and tumble or line drying. Disposables also require fewer changes because of the super absorbent materials. They leak less due to tight and snug fit. What is most frightening about disposable diapers is the passively ignored presence of toxic chemicals. Scientific studies have linked disposable diapers and their harsh perfumes and toxic substances to the increase of asthma. Using disposable baby diapers cause more diaper-rash and it is more tough to toilet train the kids. It cause allergic reactions too. Hope your business is prosperous. We are factory specializing in the manufacture and export of baby diapers for many years. We have ​profuse designs with series quanlity grade,and expressly, our price is very competitive because we are manufactory . we are the source. Our ultra absorbent, eco-friendly diapers — made with naturally derived, plant-based & sustainable materials — are extra soft, hypoallergenic, free of chlorine processing and additives (like fragrances, lotions, and latex). Totally Chlorine-Free (TCF) Wood Pulp, Absorbent Bio-Core, Plant-Based PLA (Inner & Outer Layers), Non-Toxic Adhesives. For more details, pls feel free to contact me by email directly.